The glenohumeral joint (the juncture of the ball of the humerus and the shallow socket of the scapula, glenoid). 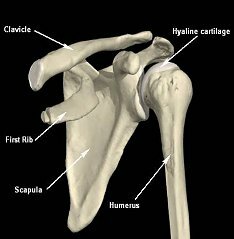 The acromioclavicular (AC) joint (the meeting of the clavicle and the acromion). The sternoclavicular (SC) joint (the meeting of the clavicle and sternum). 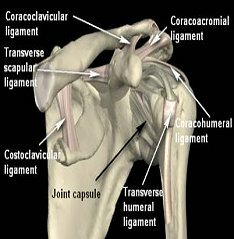 The shoulder is covered with articular cartilage (Fig.1). This material cushions and provides a smooth surface which permits movement with minimal friction. Ligaments connect bone to bone. 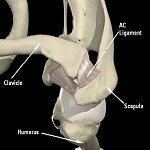 In the shoulder ligaments create a joint capsule (a watertight sac surrounding a joint). The joint capsule (Fig. 2) connects the humerus and the glenoid, maintaining stability and holding the shoulder in place to keep it from dislocating. 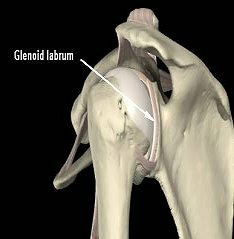 The glenoid labrum (Fig.3) is a unique fibrocartilage structure circular in nature. It attaches around the edge of the glenoid and creates a deeper socket for the humerus to sit in. 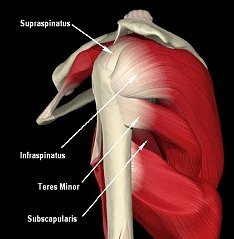 the labrum is also the attachment site of the biceps tendons. Tendons connect muscle to bone. The muscles and tendons of the rotator cuff hold the humeral head in the glenoid socket (Fig.4). The rotator cuff helps to lift and rotate the arm. 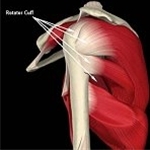 Rotator cuff tears are the most common shoulder injuries. 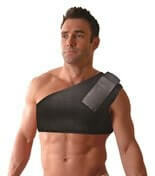 Shop our selection of shoulder braces and supports for rotator cuff tears. 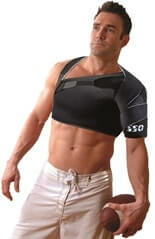 Read more..
Shop shoulder supports for a separated shoulder or AC joint separation. 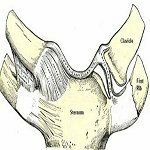 Utilizing a brace for support and stability, cold therapy, and rest can help treat minor to moderate cases of shoulde Read more.. 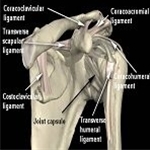 Shoulder instability is a common shoulder injury. Shop our selection of braces and supports for shoulder instability. Read more..
Clavicle fractures make up about 10% of all fractured bones in adults, but are the most commonly fractured bone in children. Clavicle braces are also used for posture control. Read more..
Buy Direct from US Manufacturer Designed with the extensive input of athletic trainers, the SSO™ can facilitate, restrain or restrict a multiple array of injuries based on the specific needs of the Read more..